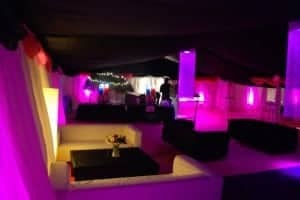 Choosing a marquee is just the beginning, whether you want a sophisticated soiree or a club vibe, with our full range of accessories & exhaustive network of trusted suppliers, we can help you complete the look. Pleated ivory linings – these are the most popular type of lining and create the most classic and timeless marquee look. They provide a simple but stunning backdrop to beautiful floral arrangements and sophisticated table settings; perfect for weddings. Flat linings – provide a more contemporary look than the traditional pleated variety. Coloured roof overlays & swags – these can create a bold and vibrant contrast to a basic backdrop, use these to colour pop or make a real statement utilising these throughout. Star cloth – bring the night sky into your marquee. Star cloth is both spectacular and dazzling, primarily used for ceilings; star cloth can create the perfect finish to a variety of looks. We have a choice of classic Georgian style windows for a traditional look and can also provide clear panoramic windows for making the most of the outside. As the sun goes down, lighting is vital in creating ambience; we can also supply generators to provide power in the most remote venues so that you are not bound to traditional sites. Chandeliers - traditional lighting creates a warm and inviting atmosphere. Pin spots – ideal for spot lighting tables or centre pieces, use several to highlight an area such as the bar or the dance floor. LED uplighters – these can be used both internally and externally. Internally, these can be used to highlight specific areas or to create a feature wall as a contrast to the rest of the marquee. Our uplighters can be programmed to change, providing a constant flow of graduating colour. 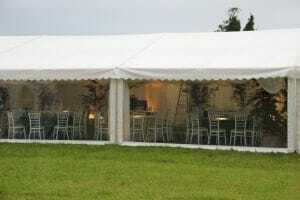 Externally they can be used to highlight the entire marquee, perfect for creating an oasis of light on a dark night. They can also be used to colour wash the marquee or the exterior of adjacent buildings. Projections - we can project images onto walls for personalisation or themed events. Tables - round tables maximise space within a marquee and can be dressed to create a variety of looks. Trestle tables are ideal for top tables or a buffet style party. Low tables help create intimate ambience for chill out zones or informal seating. Poseur tables are perfect for a club feel or providing additional focus points. Chairs - traditional banqueting chairs, bistro style chairs and wooden folding chairs are the most popular and can be dressed to suit the occasion and look. 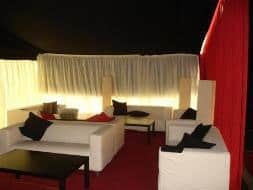 Soft seating - great for creating chill out zones and more intimate lounge areas, full sofa sets are available along with seating cubes. A selection is available ranging from the sleek and contemporary to the traditional. Brrrr….it’s never too cold for a marquee. Our marquees can be fully equipped with efficient heaters for events even in the depths of winter. Why not extend your marquee with outdoor tables and parasols, perfect for garden parties and for those balmy summer nights. We can also provide picket fencing for the ultimate classic garden party look. No one need get caught short with our range of toilets from bog standard to posh port-a-loos. 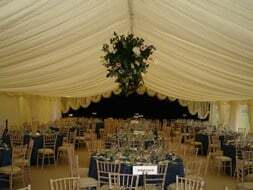 Whatever your event we’re sure to have the accessories and furniture to complete the look, at Hadley marquees we are constantly updating and re investing in stock to ensure that any and all occasions are catered for. So no matter how imaginative your theme we’re sure we can help. 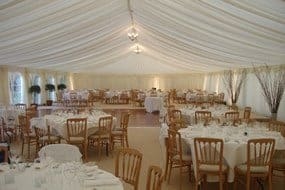 Marquee accessories and furniture including marquee linings, window walls, lighting and power, flooring, carpets and furniture by Hadley Marquees the event marquee specialists for Norfolk, Suffolk, Cambridgeshire and Essex.